The most dynamic cities of the 21st century, such as New York, are anthropomorphic alloys that act as engines for innovation and social cohesion. These cities, with their continually evolving demographics, will forge the dynamic societies of the future. With the rapid rise of near instantaneous communication, a city’s’ livability has gained prominence as an attractor for top minds. In order to secure its future as the leading global center, New York needs to continue to grow in smart ways. We see the opportunity to draw the energy of Manhattan out into the four other boroughs without disrupting existing land use. We propose a residential typology rooted in the remnant spaces surrounding the intersection of transportation infrastructure, such as elevated train lines and freeway interchanges. With the proposed design and specified materials, we aim to optimize a heterogeneous and highly linked set of living environments capturing the air rights above these systems. The combination of escalating land prices and the acceleration of city migration have made urban renewal based modes of densification unfit for the contemporary city. Urban Alloy is the symbiotic repurposing of the air rights above transportation corridors in New York. 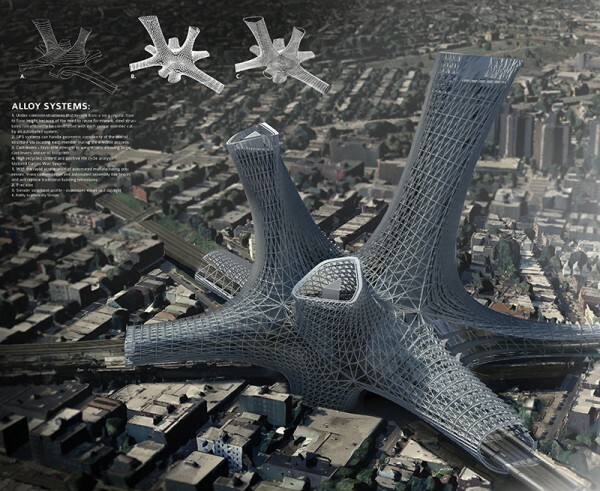 Urban planners have long touted the benefits of greater housing density near public transportation hubs – Urban Alloy proposes the advancement of this idea by locating the system directly on the intersections between surface and elevated train lines. We have chosen the intersection of the LIRR and the 7 trains as a test case. The paradigm of one-size fits all is obsolete. Urban citizens want diverse living situations where they can work, play, eat and rest within a pedestrian zone. As technology creates the market desire and a conditioning for personalization, society is more willing to pay a premium for spaces that are tailored to their particular needs. The towers’ design facilitates a continuous blend of program and space types that are accommodated by a spectrum of floor heights and enclosure conditions. 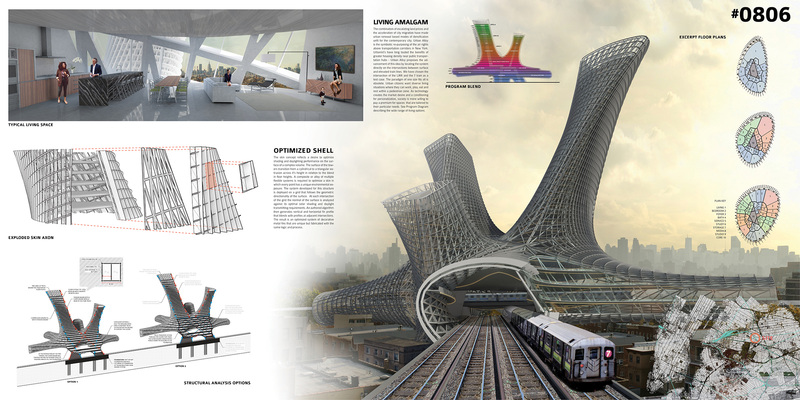 The skin concept reflects a desire to optimize shading and day lighting performance on the surface of a complex volume. The surface of the towers transitions from a cylindrical to a triangular extrusion across its height in relation to the blend in floor heights. A composite or alloy of multiple flexible systems is required to optimize a skin in which every point has a unique environmental exposure. The system developed for this structure is deployed on a grid that follows the geometric directionality of the surface. At each intersection of the grid the normal of the surface is analyzed against its optimal solar shading and daylight transmitting requirements. An authored algorithm then generates vertical and horizontal fin profiles that blend with profiles at adjacent intersections. The result is an optimized system of decorative metal fins that are unique but fabricated with the logic and process described below. 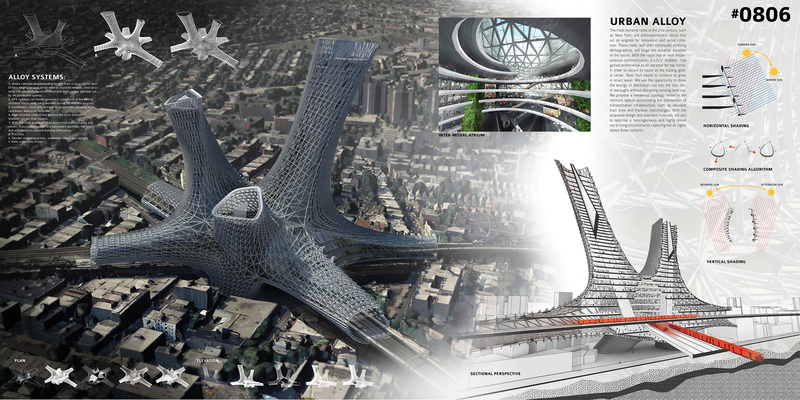 The steel diagrid structural system can efficiently be constructed with each unique member cut by an automated system. GPS systems can handle the geometric complexity of the overall structure via locating each member during the erection process. Cantilevers benefit from a favorable strength to weight ratio allowing large cantilevers and small footprints. With a high-recycled content and positive life cycle analysis the unitized curtain wall system will also be fabricated with rapid automated manufacturing processes. Precision and slender structural profile that maximizes views and daylight skin the entire building.